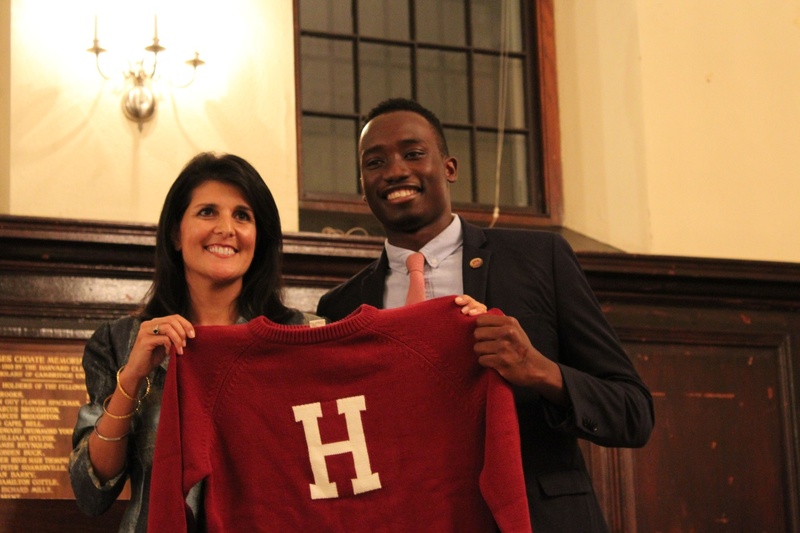 South Carolina Governor Nikki R. Haley is presented with a Harvard “letter sweater” by Harvard Foundation intern Nuha Saho ‘18 at the conclusion of the dinner event where she was invited to make remarks Thursday night. Haley spoke with pride about the idea of a “New South” that promoted racial and economic equality and defended the Republican Party from accusations of racism and intolerance. South Carolina Governor Nikki R. Haley was honored by the Harvard Foundation for Intercultural and Race Relations on Thursday evening with a dinner ceremony to celebrate her contributions to the progress of racial justice. Harvard Foundation Director S. Allen Counter presented her with an award of appreciation for her calls to remove the Confederate flag from the South Carolina state capitol this past summer. In remarks in Winthrop House, Haley described the bright future of a “New South” dedicated to tackling historical problems of racial and economic inequality. She also offered a defense of the Republican Party and its values in solving problems for low-income people and people of color in her state. “I would not have won the Republican primary if this were a racially intolerant party,” said Haley, who is Indian American. “That was not possible with the flag flying,” she concluded. Haley, while maintaining that “black lives do matter,” argued that the uprisings in other cities in fact hurt black people who face police violence. Charleston, in contrast, saw no violence in the wake of the church massacre, with Haley describing the local reaction as a peaceful coming together to mourn the loss of life. While Haley’s remarks were met with applause, students who attended the ceremony were more mixed in their reactions. Still, Parker pushed back on the contrast Haley drew between the reactions to violence in Charleston and that in Ferguson and Baltimore, suggesting that the “volatile responses” seen there “probably created the social pressures” that made the peaceful response in South Carolina possible. “It all just goes to show these conversations are pretty complicated,“ he said. Haley met with University President Drew G. Faust and Dean of the College Rakesh Khurana during her visit, according to Counter. 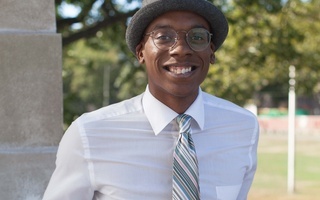 —Staff writer Sidni M. Frederick can be reached at sidni.frederick@thecrimson.com. Follow her on Twitter @SidniFrederick. I do not know what Governor Haley’s true views on race are, but I do know that her policies have made life tangibly worse for people of color in her state. 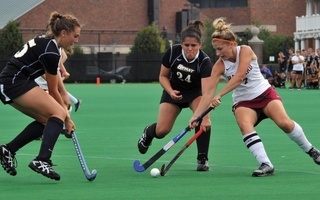 I know that her actions have been in direct contradiction to the values that the Harvard Foundation claims to embody.